Hey, there friends! I know, I know. Where have I been? Right? I am terrible about this blog. I am always saying I need to post more on my neglected blog. I have so many patterns that I need and want to share with you guys! I have a big problem with getting distracted and I pretty much have no concept of time. My other problem (and a problem that a lot of hookers have) is that I write patterns down in these random notes all over the place and they are in what I like to call Katonese...a language only I seem to understand. I'm pretty sure any of you who "wing it" and try to write down what you do know exactly what I'm talking about. Anyway, this one might not be some spectacular pattern, but I happen to love it. It's so simple and there are so many fans of The Nightmare Before Christmas out there so I need to share it. Please forgive my pictures. These pictures were taken long ago before I mastered the art of picture taking and editing (I'm still not THAT great at it, but I would like to think I have improved.). If you have any questions please feel free to post them. If I don't get back to you in a timely manner please visit my Facebook page and message me there. I don't get blog comment notifications as easily as I do Facebook notifications sometimes. And while I'm mentioning my Facebook page...I have vowed to post more patterns on a REGULAR basis! So, please follow me on Facebook for regular updates on new, FREE patterns! Or to bug me about when I'm going to post a new pattern! As always, you did the work here. So, whatever you decide to do with what you make is up to you! Happy hooking! Here is what I did with my Jack Skellington Applique. Eyes- Switch to a G hook. Make a magic circle. 5 HDC in MC. Mouth- For the mouth I make the long smile part first. Then, I go through and make 8 stitches across the mouth to hold it down and make it have the Jack Skellington smile look. Make a nose with this same yarn and tie off. You don't really have to worry about what the back of this looks like because you'll be sewing it on something and the back will be hidden. Sew onto whatever you like! *Edit* For anyone wanting the glove pattern that I used just follow this link here. These are one of my favorite glove patterns to whip up some quick fingerless gloves and they are super easy to adjust size and length. This is adorable! 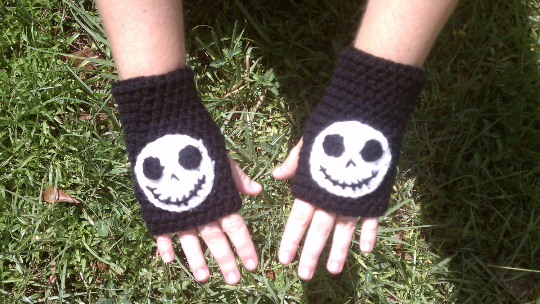 I want to make those gloves with the Jack for my niece. What is the link to the glove pattern? I subscribed to your blog through email! I will post the gloves on my blog when I am finished with them. Oh, man! I never saw your comment until today. I will be sure to check your blog out! Yep, that should do it! I just wanted to say how glad I am that I came across your pattern. 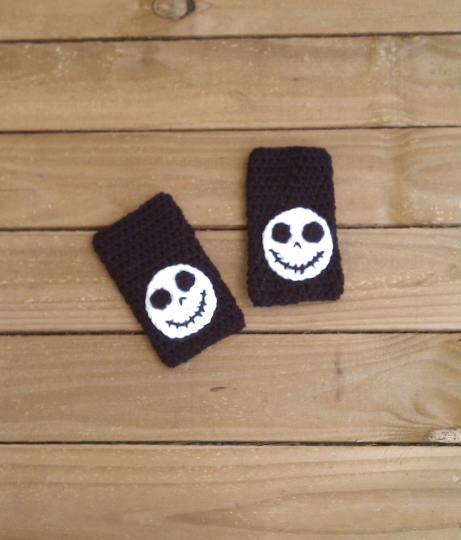 I was looking all over the place for the right pattern for Jack Skellington's face to put on a baby blanket that I've made for a die-hard Nightmare Before Christmas fan and when I came across yours, it was perfect! Thank you so much for this pattern!